Agroturismo Son Tomaset in Costitx is a country house with 13 Rooms. Surrounded by 5000 m2 of gardens and fruit orchards, Son Tomaset features 2 outdoor pools with sun terraces, and rooms and apartments set in its 4 Mallorcan-style stone buildings. All accommodation at Son Tomaset includes free Wi-Fi, free private parking and private bathrooms. Decorated in a charming, rustic style, the rooms and apartments feature beamed ceilings and wooden furnishings. Several furnished terraces can be found at Son Tomaset with fantastic views of the Tramuntana Mountains. Offer...ing a peaceful, country location, it is located between Inca and Sineu, at 10 minutes’ drive from both. You will find shops and restaurants in these towns. Palma city centre and Palma Airport can be reached in a 30-minute drive. 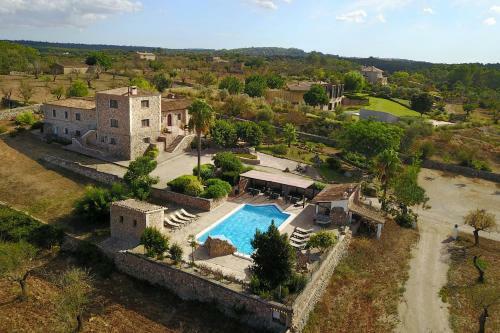 Surrounded by 5000 m2 of gardens and fruit orchards, Son Tomaset features 2 outdoor pools with sun terraces, and rooms and apartments set in its 4 Mal...lorcan-style stone buildings. All accommodation at Son Tomaset includes free Wi-Fi, free private parking and private bathrooms. Decorated in a charming, rustic style, the rooms and apartments feature beamed ceilings and wooden furnishings. Several furnished terraces can be found at Son Tomaset with fantastic views of the Tramuntana Mountains. Offering a peaceful, country location, it is located between Inca and Sineu, at 10 minutes’ drive from both. You will find shops and restaurants in these towns. Palma city centre and Palma Airport can be reached in a 30-minute drive. When would you like to stay at Agroturismo Son Tomaset? Children and extra beds Up to two children under 6 years are charged EUR 10 per night when using existing beds. All children under 2 years stay free of charge for children's cots/cribs. All further older children or adults are charged EUR 10 per night for extra beds. The maximum number of extra beds in a room is 1. Supplements are not calculated automatically in the total costs and will have to be paid for separately when checking out. Any type of extra bed or child's cot/crib is upon request and needs to be confirmed by the innkeeper. Please inform Agroturismo Son Tomaset in advance of your expected arrival time. You can use the Special Requests box when booking, or contact the property directly with the contact details provided in your confirmation. Please let Son Tomaset know your expected arrival time in advance. You can use the Special Requests box when booking or contact the property.